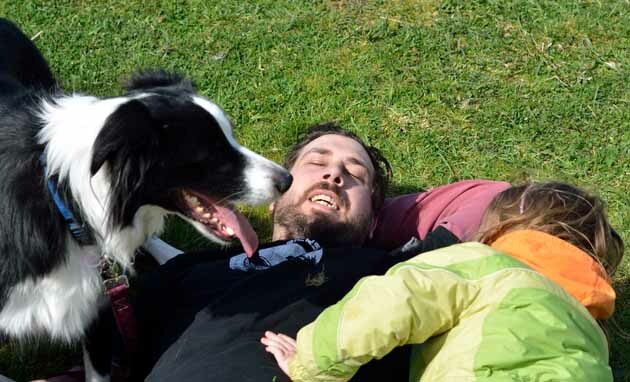 Last week my brother, Eli, and his 5-year old daughter, Addie, came to visit us. Since they live in a landlocked state, a trip to the Oregon coast was a must. A day trip to the coast is fun, but it feels like you spend your entire day driving back and forth and very little time doing stuff at the beach. So, we opted to go tent camping for one night. My wife Kerri didn’t like that idea. Kerri has developed a syndrome that affects people once they purchase an RV known as tentaphobia. Since purchasing our cushy Coleman tent trailer a few years ago, Kerri refuses to sleep on the non-climate controlled uncomfortable floor of a tent. Even with the promise of air mattresses and our super warm sleeping bags, she wasn’t interested. So, it was going to be a daddy-daughter campout and Kerri was going to have a nice quiet evening doing what she loves doing most, reading books and watching chick flicks. 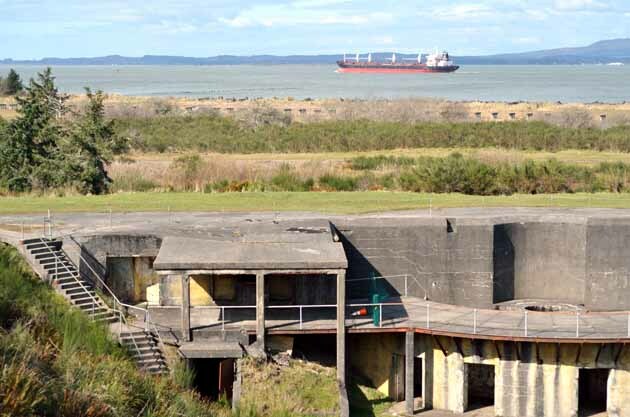 We chose to camp at Fort Stevens State Park located just south of Astoria where the Columbia River and Pacific Ocean meet. Even though it was early Spring I decided to reserve a tent site just in case. This turned out to be a smart decision as they have converted many of the tent sites to deluxe cabins and only a couple of tent sites were available. 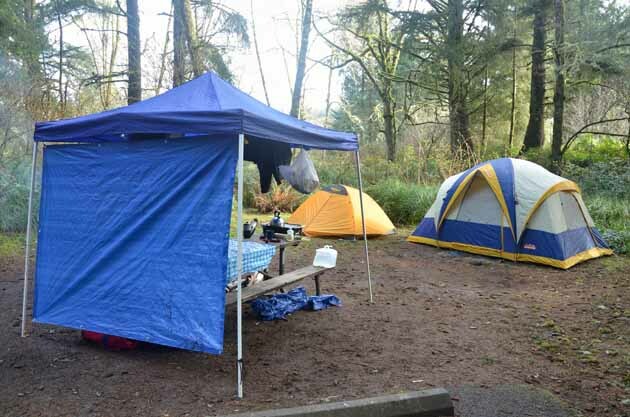 Even though Fort Stevens has over 700 camping sites, most of those are RV sites and offer little space for tents. After a 2 hour drive from Portland we found our campsite and made camp. 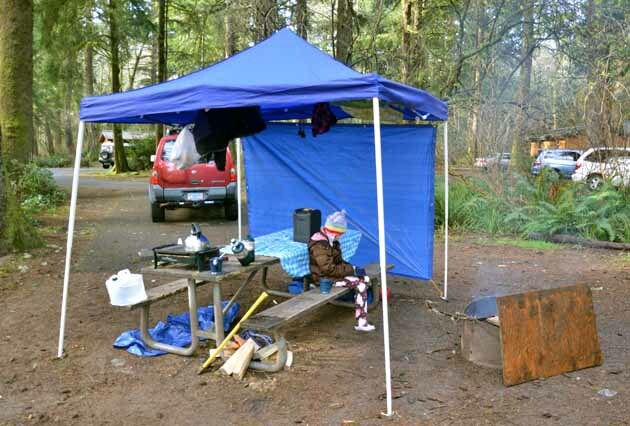 Having lived in Oregon all my life and being a frequent camper there are a couple of things one must do to be comfortable while tent camping on the coast. First thing is to bring lots of plastic tarps as it rains year round and that rain often comes in sideways. Second thing is to stock up on lots of dry firewood for a huge fire. Unlike camping in our heated trailer, a fire is your only source of heat when tent camping. As soon as we set up the tents and tarps, the rain started. Typical! My 7-year old daughter, Sydney, and her cousin were bouncing off the trees with energy and excitement. 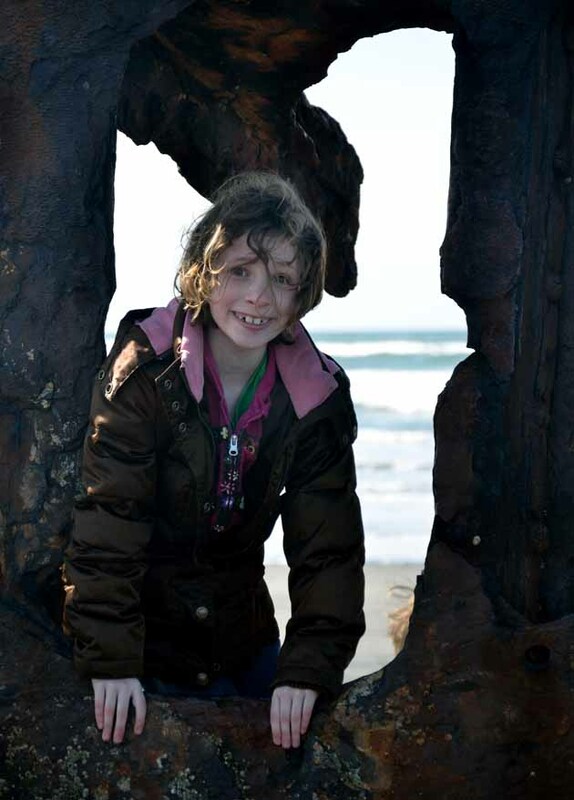 We decided to wear them out by taking them for a long walk to the beach in the rain and check out the skeletal remains of the Peter Iredale, a massive sailing ship that came ashore in 1904. It worked great, but now we were all wet. Back at camp we started a large fire and prepared the ultimate dinner for cold weather camping, chili dogs and hot tea!It rained all night but I awoke the next morning to sunshine. It was brisk, but at least the sun was out which is a rarity on the Oregon coast. I started a fire and made tea for Sydney and I, the only ones who were up at that point. Sydney sat by the fire with her herbal tea and played a game on her Nintendo DS while I prepared a hearty breakfast for everyone; animal pancakes, sausage, hash browns, and fresh fruit. After breakfast we all decided to head back to the beach for some 4-wheel fun. 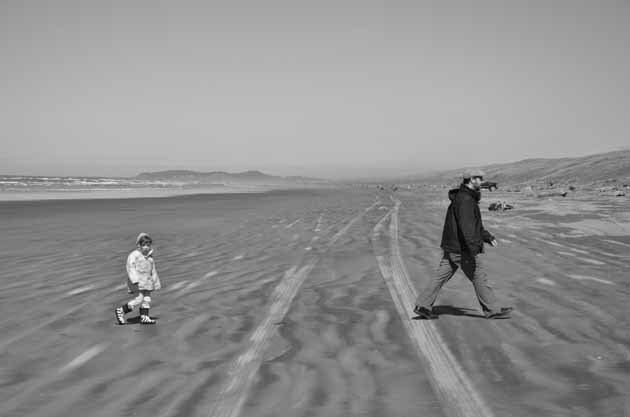 Fort Stevens is one of the rare beaches in Oregon where you can actually drive on the beach. 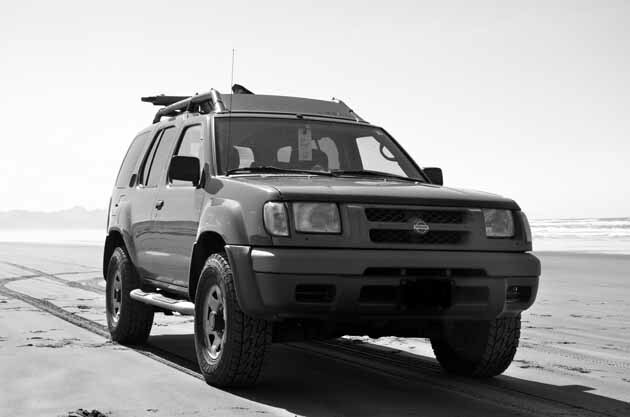 After punching through the soft sand at the ramp leading to the beach we drove down the beach looking for seashells the easy way; through the windshield of a heated SUV. 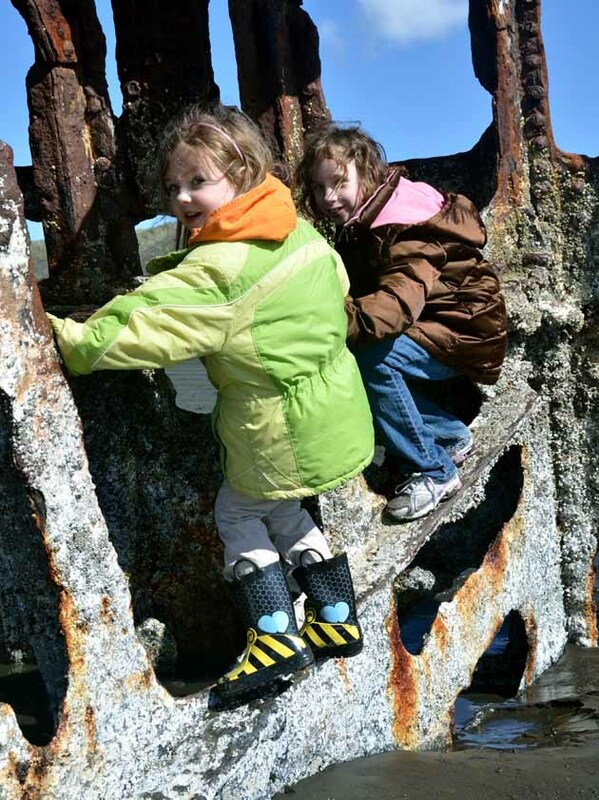 We then returned to the Peter Iredale where Sydney and Addie had fun climbing on the barnacle encrusted remains of the once massive ship. Eli and Addie on Abbey Road? Two more people and it could be a Beatles album cover! 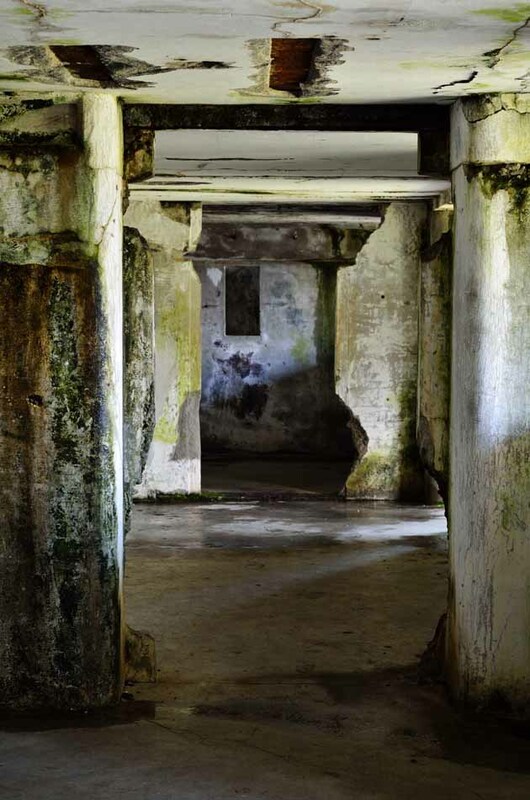 After our 4×4 beach adventure we packed up camp and went to explore the old structures of the former military fort. 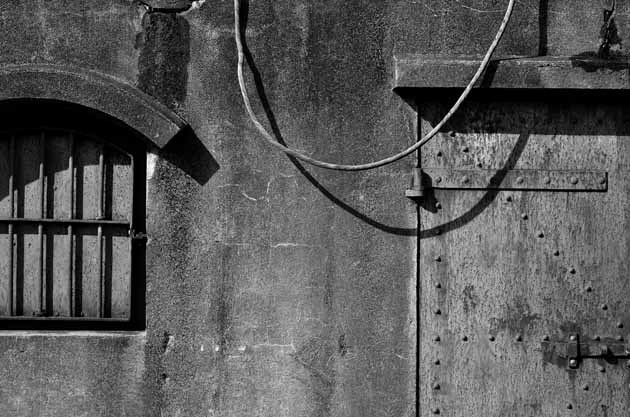 Fort Stevens was established at the beginning of the American Civil War as the primary military defense for the mouth of the Columbia River. It served for 84 years until the end of WWII. 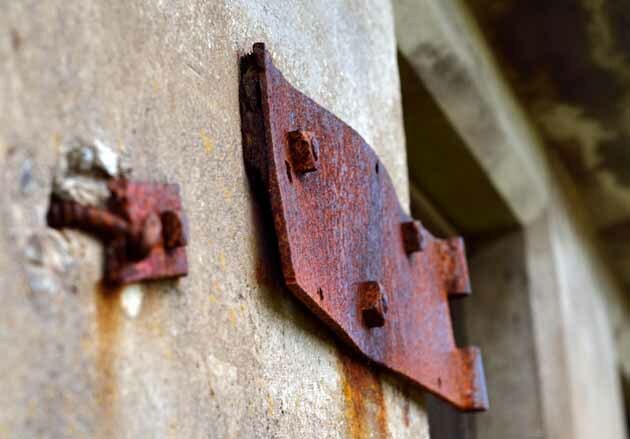 In 1942 a Japanese submarine fired 17 shells at Fort stevens, but did little damage. 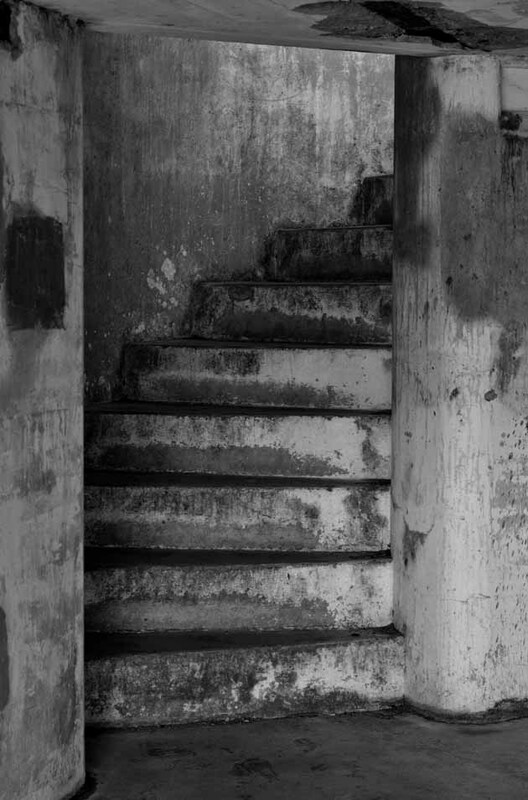 Today, the old military bunkers make for a great place to explore, photograph, and let your wild kids run amuck. 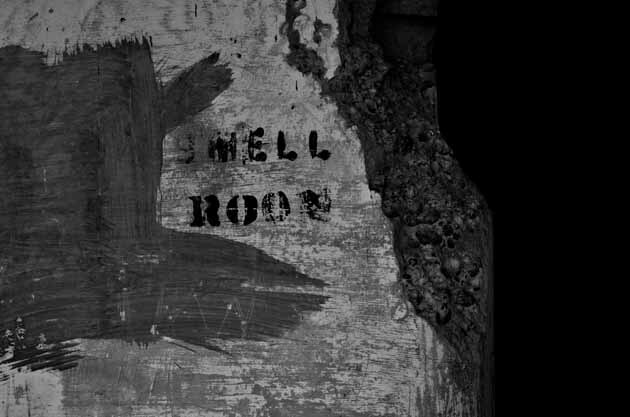 Hell room? Don't go in there! 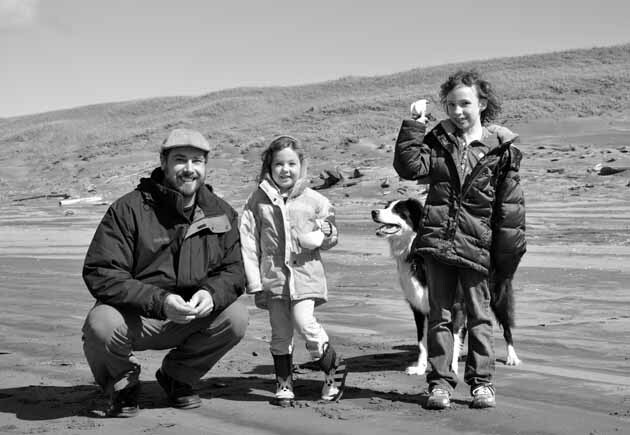 We had a great time camping at Fort Stevens and spending quality father-daughter-brother-cousin-neice-uncle time together. I forgot how much fun it is to actually “rough it” by sleeping in a tent; with air mattresses of course. Hopefully, I can convince Kerri to go tent camping one last time before we sell our camping gear and start our around the world adventure later this year. One of the things that I will miss when we leave for our round the world adventure is my local library. I did not really discover or come to love my local library until after I had Sydney. Admittedly, before having a child I was one of those people that if I found an interesting book I would just go out and buy it – resulting in piles of books read only once. I did have a library card before Sydney, but I cannot really think of a time that I checked out books. After Sydney was born, I was looking for free activities which I could do with her and found reading time at our local library. This turned into a weekly routine of going to the library and checking out children’s books. Now that Sydney has started school and we can no longer attend reading time, every Tuesday after school Sydney and I will walk down to the library to check out books. Sydney always comes home with a pile of books, some entertaining, and some kind of strange. Through this routine I have enjoyed discovering some great children’s books. Who knew that Geronimo Stilton or Percy Jackson could be enjoyable to read as an adult? I have also come to enjoy watching Sydney select the books she likes, asking the librarian whether they have such and such book, and be so excited about reading the book she got. For a while now Sydney has been asking for a library card and just recently I finally agreed to let her get one. It was a very exciting moment for her filling out the information for her first library card. As we established this weekly routine of going to the library, I began to look around and realize how much free information is available to us for free! I love the fact that if I am interested in a subject such as traveling, photography, cooking or whatever else is currently holding my interest, I can do a search and find numerous books on the subject. The only drawback: at our local library you can only have 15 holds at a time. Luckily for me, I have commandeered Jason’s library card and can now have twice as many holds. But, I am not too greedy and do occasionally allow him to place a book on hold. So, back to my original point on how much I will miss my locale library when we travel. I was initially nervous about what I would do for books while we are traveling. Though, Jason has had some luck with book exchanges at some of the places we have traveled to, that plan seems a little too risky for me. What if I am not able to find a book that looks interesting that is in English? I definitely cannot lug around an entire suitcase of books with me; Jason just won’t go for that. Mailing books also seems like a really expensive proposition and unreliable. Fortunately for me, last year my mother solved this problem as she gave me a Kindle e-reader for my birthday. Since this generous gift, I have taken my Kindle on several trips and found it worked out great. Advantages to the kindle: it’s small, portable and I can find a book wherever I am as long as there is a wireless connection. 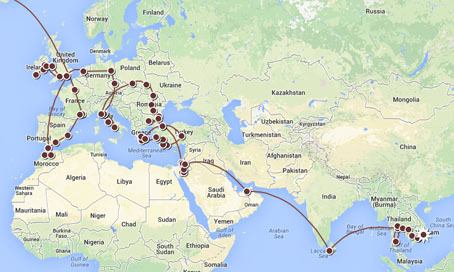 Taking the Kindle around the world seemed like a viable solution. But then I started thinking about the cost, I could easily spend $40+ a month in books just for me. That would not include books for Sydney or Jason. Given the cost, this would not work with our tight budget. When I first received the Kindle, I noticed the library had ebooks that could be checked out. However, I could not figure out how to download the ebook onto the Kindle. Recently while in the library, Jason pointed out a pamphlet on how to download library ebooks to the Kindle. Success! Since I have come across this pamphlet I have been able to request and download books. I am so excited to think that I will have access to a bit of home around the world… my local library. With the popularity of ebooks it is only a matter of time before every public library offers free ebook downloads. So, if you are looking for free ebooks, be sure to check with your local public library.